A cracked tooth always needs attention. Although it was probably unexpected, tooth damage can threaten both the health and aesthetics of your smile if left untreated. Patients in the O'Fallon area can trust Dr. Schwarz of Riverheart Family Dentistry for excellence in cracked tooth repair. 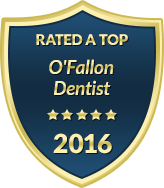 We are a family dental practice that is uniquely equipped to treat all aspects of your smile with the comfort and convenience you deserve. When it comes to a cracked tooth, chipped tooth or other tooth damage, we offer a full range of options in restorative, cosmetic and general dentistry. Dr. Schwarz uses the most durable and natural-looking materials to ensure your smile is restored to your satisfaction. Our restorative treatments are performed by a team of knowledgeable and compassionate dental professionals. From the moment you walk in our doors, you will discover how deeply we value your comfort. Not only is our office equipped with modern patient amenities, but we also offer sedation dentistry to lessen your anxiety and discomfort during your procedures. The first step towards successfully restoring your cracked tooth is to evaluate the severity of your damage, as this will help Dr. Schwarz determine which procedure is best for you. Dental bonding is most frequently used for tooth damage that is minor or only includes chipping of your enamel. Bonding is a simple, cost-effective and quick procedure that can leave your cracked tooth unnoticeable. Dr. Schwarz uses tooth-colored composite resin to discreetly bond the damaged areas of your tooth back to its original shape and strength. For tooth damage that requires more extensive repair, a dental crown or porcelain veneer may be recommended. Dr. Schwarz carries distinguished skill in both these procedures, with the ability to restore the visible portions of your smile with the highest level of aesthetics and durability. Although we can ensure your smile looks its best after tooth damage, we never lose focus on the health of your smile. If your tooth damage has penetrated to the pulp (center) of your tooth, a root canal may be needed first to alleviate your pain and prevent infection. If you have a cracked tooth, please contact us as soon as possible. We offer emergency dental care to patients in O'Fallon and we will do our very best to see you promptly. At Riverheart Family Dentistry, we value the importance of a functional, healthy and attractive smile. If tooth damage is compromising your smile in any way, we want to help. To help you afford unpredicted tooth repairs, our practice offers flexible financing and payment plans to those who qualify.